TAMPA, FL--(Marketwired - Apr 14, 2014) - Florida may be accustomed to its share of events surrounding the glitterati, but there are still a few happenings that get residents justifiably excited about something. One such instance is the International Indian Film Academy (IIFA) weekend, which is arriving in Tampa between April 23 and 26, 2014. With panel discussions, film screenings and a spectacular awards ceremony that outshines virtually every other, the IIFA weekend is full of the sort of pomp and circumstance that begets legends. And putting guests in an ideal position to enjoy it all, with rates starting at $339, is the Tampa Marriott Waterside Hotel & Marina. Ideally situated downtown and adjacent to the Tampa Convention Center (which is hosting numerous IIFA events during the weekend), this hotel's location and extensive amenities make it one of the best hotel deals in Tampa, FL. Guests will find themselves just steps away from events like the IIFA Global Business Forum, the IIFA Expo and the IIFA Rocks event and post-party. Other IIFA events are just as accessible. The IIFA Awards will be held at the Raymond James Stadium, which means that hotel guests can easily be part of awards excitement as well as the dazzling choreography and music that have made Bollywood famous around the world. And the IIFA Media & Entertainment Summit will occur on-site at the hotel. Of course, few Downtown Tampa, FL hotels can rival this property for event space. Its 36 meeting rooms afford an impressive 50,000 square feet of versatile function space, including the Grand Ballroom, which can accommodate 2,000 people. But its meeting space is only one of the property's many distinguishing features among hotels in Tampa Bay. Guest rooms and suites include HD televisions, down comforters and, in select rooms, balconies. Those water views put guests in the right frame of mind to check out the rooftop pool and full-service marina, which capitalize on the hotel's waterfront location, while the spa and fitness center promise diverse ways to unwind after a long day of celebrity sightings. And when it's time to dine, the hotel's five eateries embrace versatility with options ranging from Starbucks, to the casual Waterside Grill, which serves American fare prepared with produce grown in the property's rooftop garden. Plus the hotel's location means guests are only minutes away from the best of Downtown Tampa Bay dining. With competitive rates and incomparable accommodations, this is one Downtown Tampa hotel that is bound to earn rave reviews during the IIFA weekend and beyond. Featuring a prime waterfront location along Tampa Bay, the Tampa Marriott Waterside Hotel & Marina is a luxury hotel with all the right amenities. A newly remodeled patio, for example, overlooks the water and invites guests to cozy up next to the fire pits. Other upgrades from the $2.5-million renovation include new furnishings in the lobby, a Wi-Fi-equipped Starbucks and a sports bar updated with flat-screen televisions and sports-centric décor. The 719 spacious guest rooms and suites are equally inviting with bay and city views and, in the suites, a living room, entertaining space and sleeper sofa. If guests visit for work, the hotel's recently updated 50,000 square feet of meeting space and three concierge levels are designed to accommodate any business-related need. The on-site spa, rooftop pool and pool bar, fitness center, sauna and whirlpool, meanwhile, show visitors what it means to relax. This winning combination of originality and indulgence makes the hotel both universally appealing and unlike anything else around. 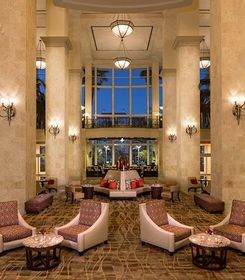 Ideally situated downtown and adjacent to the Tampa Convention Center (which is hosting numerous IIFA events during the weekend), this hotel’s location and extensive amenities make it one of the best hotel deals in Tampa, FL.